The relative frequency of brassica appearances in political discourse reflects their abundance in the modern grocery cornucopia. 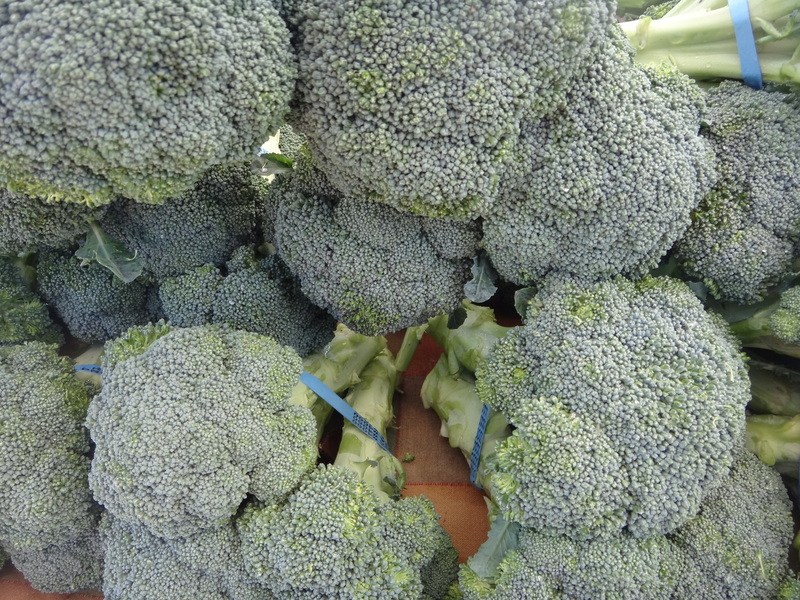 In previous posts we discussed the numerous varieties of Brassica oleracea (including kale, collard greens, Chinese broccoli, Brussels sprouts, kohlrabi, cabbage, broccoli, and cauliflower) and other Brassica species (turnips, rutabagas, rapini, napa cabbage, tatsoi, bok choy, mizuna, mustard greens, mustard seeds, mustard or canola oil). 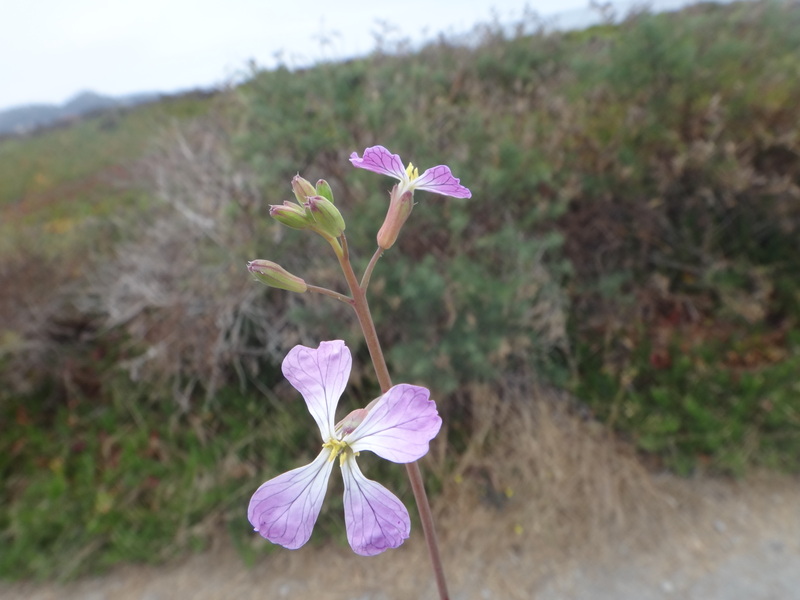 This post completes our whirlwind tour of Brassicaceae food plant diversity. We introduce the widely cultivated species that are in genera other than Brassica: radishes, wasabi, horseradish, watercress, sea kale, and, yes, arugula. This list is made even longer by several other weedy species that are infrequently under cultivation or have been at some point in the last few hundred years and are often harvested by enterprising foragers. In subsequent posts we’ll dive into some of the chemistry and genetics of these crucifers, and many of them will star in their own posts. For now we simply want to observe the impressive diversity of and relationships among cultivated species in the Brassicaceae. 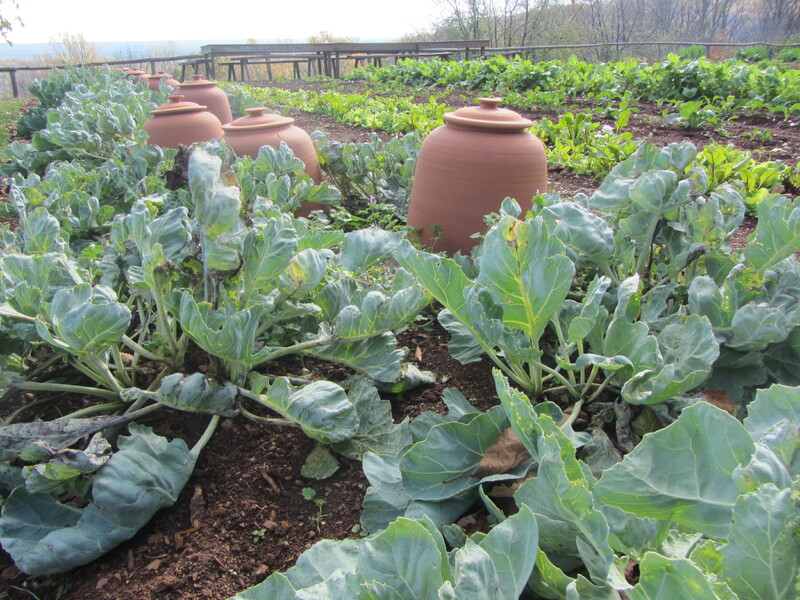 Species in the Brassicaceae are often referred to as “brassicas” or “crucifers” or “cruciferous” in reference to the older name of the family, Cruciferae, meaning “cross-bearing.” The name comes from the four petals of flowers typical of the family, which are arranged in something of a cross. Southwest Asia is the center of diversity of this large cosmopolitan family. Its 330 genera and 3700 species spread from there primarily into northern temperate regions. 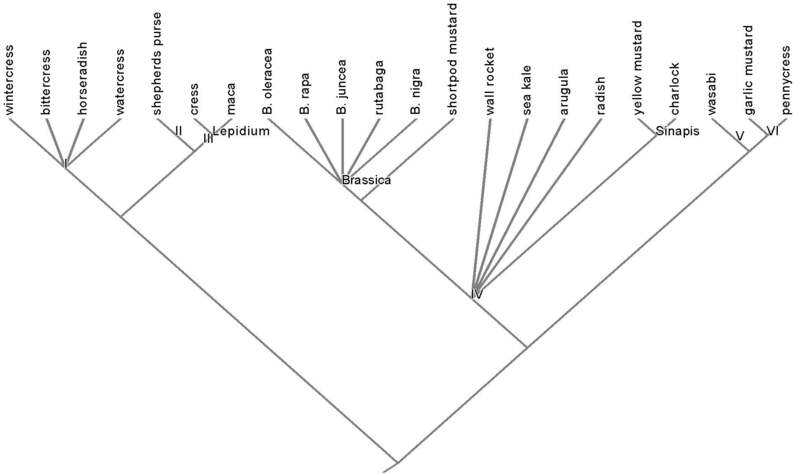 These taxa comprise 35 monophyletic tribes (clades within a family), as determined by molecular surveys and morphology (Al-Shehbaz 2012, Beilstein 2008). Only six of them contain genera frequently cultivated or harvested for food, shown on the phylogeny below. Phylogeny of cultivated plants in the Brassicaceae. Numbered tribes are: (I) Cardamineae; (II) Camelineae; (III) Lepidieae; (IV) Brassiceae; (V) Eutremeae; and (VI) Thlaspideae. Several species of crucifers have undergone millennia of selective breeding in Europe and Asia and are some of the most nutritionally important vegetable, spice, and oil plants on the planet, accounting for Brassicaceae’s distinction as one of the most well represented families in the modern grocery cornucopia. 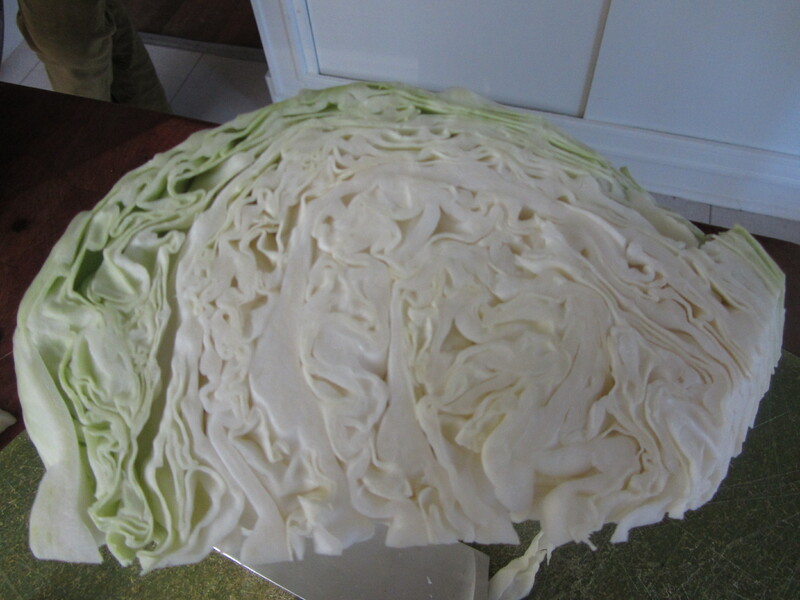 Non-Brassica cruciferous vegetables primarily grown for their leaves include arugula (Eruca sativa), watercress (Nasturtium microphyllum), and sea kale (Crambe maritima). 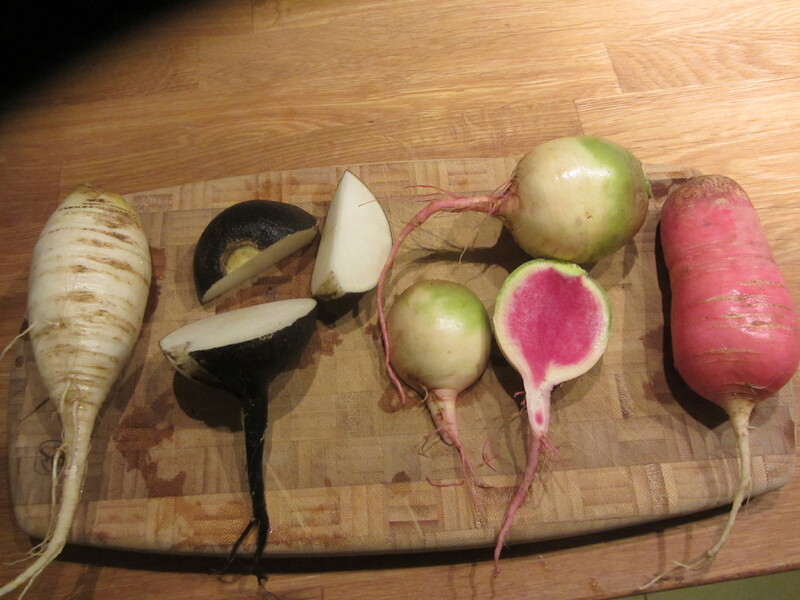 Radishes (Raphanus sativus), horseradish (Armoracia rusticana), and wasabi (Eutrema japonica) are primarily grown for their roots, although the aboveground parts are perfectly edible and can be quite tasty, especially radish leaves. Much of the “wasabi” available outside of the nicer restaurants in Japan is actually horseradish and other powdered crucifers with a green dye job. 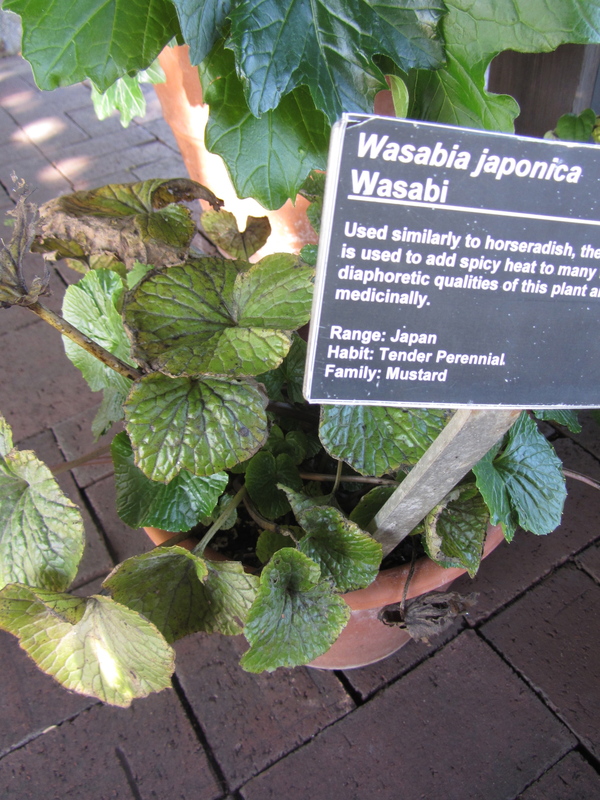 Although the flavors of true wasabi and horseradish are similar, note on the phylogeny above that they are actually fairly distantly related within the large, 40ish-million-year-old family (Al-Shehbaz 2012). Cress (Lepidium sativum) is a common European garden herb, harvested for its leaves, while its congener maca (Lepidium meyenii) has been cultivated for its roots in the Peruvian Andes for centuries. Lepidium also boasts several edible weed species. 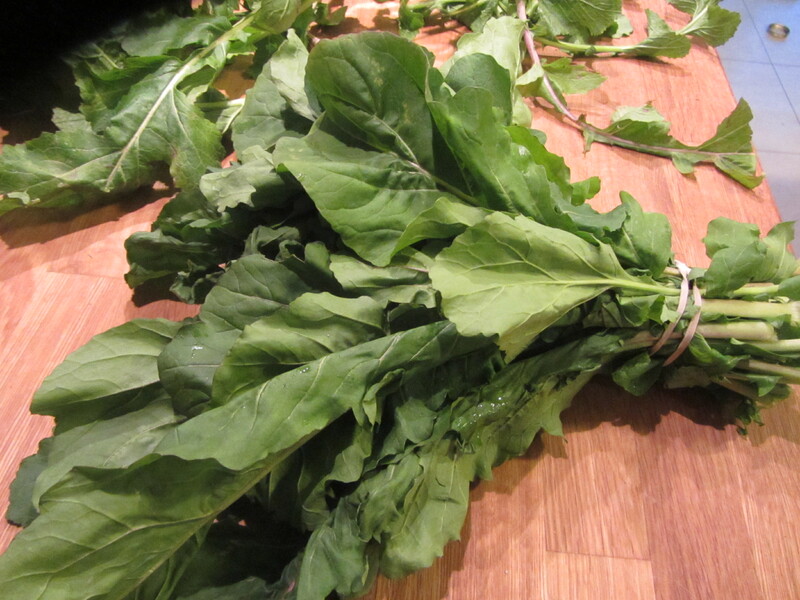 See Green Deane’s excellent discussion for more information on harvesting and preparing them. Wild mustard species are abundant, and many of them are weeds and can be quite invasive. Some of these wild weedy mustards are escaped cultivated species, most notably radish (Raphanus sp. 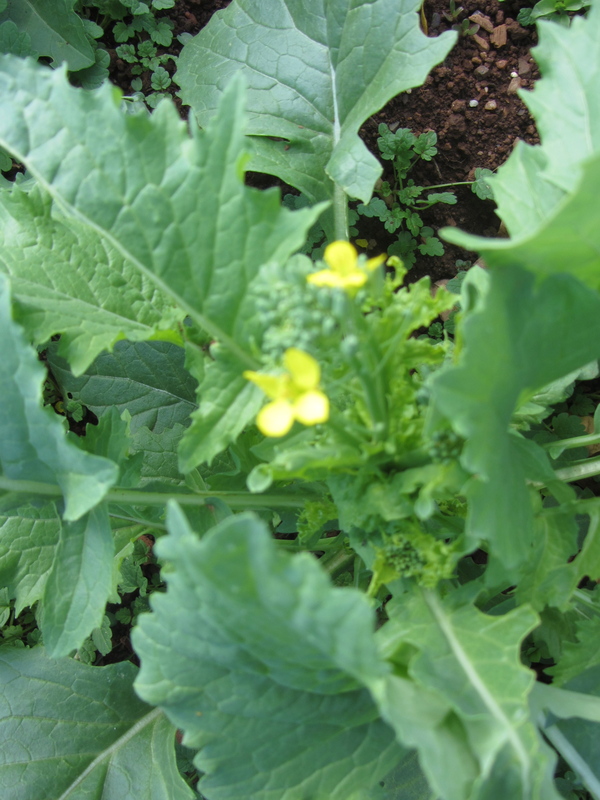 ), black mustard (Brassica nigra), and Brassica rapa. Many other weedy mustards were historically cultivated for oilseed or greens and still are in parts of Europe and Asia, including pennycress (Thlaspi arvense), garlic mustard (Alliaria petiolata), wintercress (Barbarea sp. ), charlock (Sinapis arvensis), bittercress (Cardamine hirsuta), shortpod mustard (Hirschfeldia incana), wall rocket (Diplotaxis sp. ), and shepherd’s purse (Capsella bursa-pastoris), which is the second most common weed on earth (Al-Shehbaz 2012). 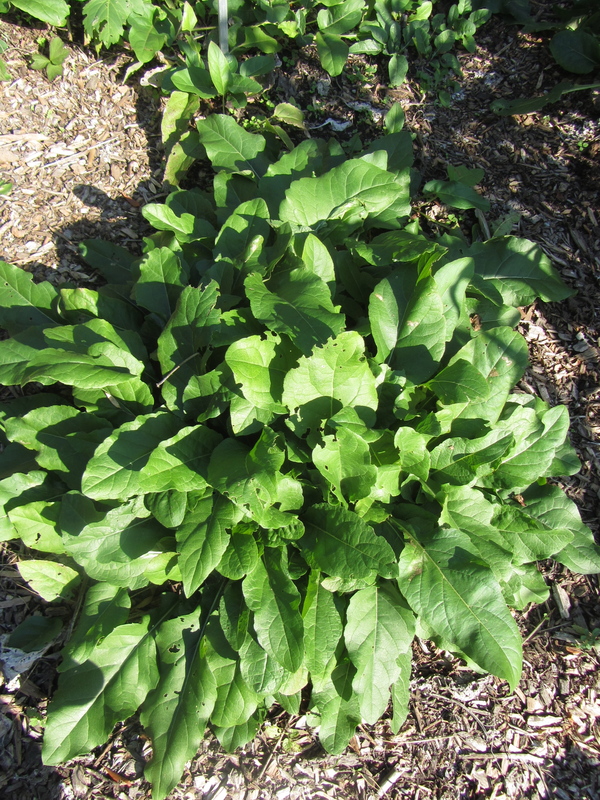 These weedy mustards are all edible, although they can be quite strongly flavored. 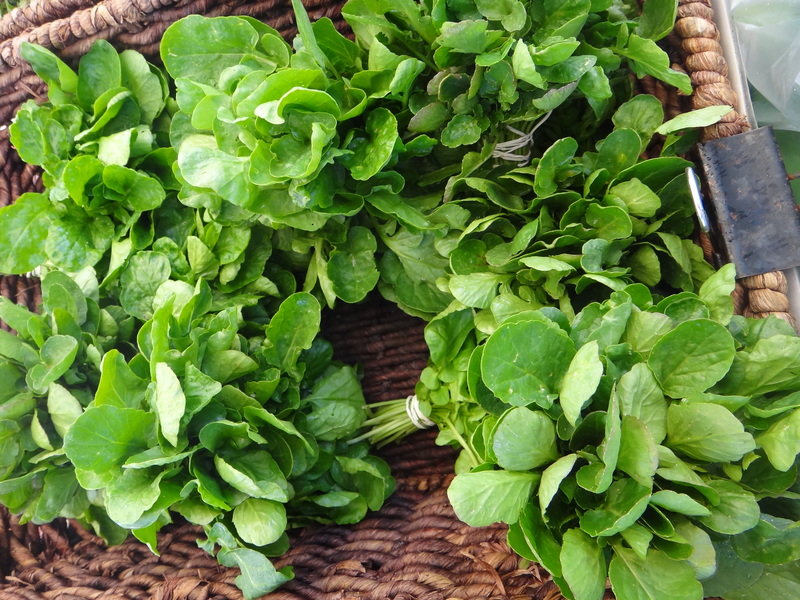 The young greens, inflorescences (see the B. oleracea post for description of the inflorescence, the flower stalk), and young pods can all be harvested for salads, sautéing or pickling. The seeds can be used to make a mustard condiment and can be used as a seasoning (particularly nice ground into a vinaigrette). While the metal accumulation ability of all of these particular mustards is not known, we know that Brassica juncea can accumulate metals (Salt et al. 1995), so it is probably wise to avoid harvesting these wild species from soil of high or unknown pollution concentration. Beilstein, M. A., I. A. Al-Shehbaz, S. Mathews, and E. Kellogg. 2008. Brassicaceae phylogeny inferred from phytocrome A and sequence data: tribes and trichomes revisited. Salt, D. E., M. Blaylock, N. P. B. A. Kumar, V. Dushenkov, B. D. Ensley, I. Chet, and I. Raskin. 1995. Phytoremediation: A novel strategy for the removal of toxic metals from the environment using plants. Nature Biotechnology 13: 468-474. This entry was posted in Uncategorized and tagged arugula, Brassica, Brassicaceae, Brassicales, broccoli, crucifer, diversity, eudicot, horseradish, Jeanne L. D. Osnas, Liberty cabbage, Obama, phylogeny, politics, radish, Scalia, sea kale, turnip, turnip day, vegetable, wasabi, wild mustard. Bookmark the permalink.